At least eight children have been killed in the last 24 hours as Operation Protective Edge launched by Israeli forces entered its second day. 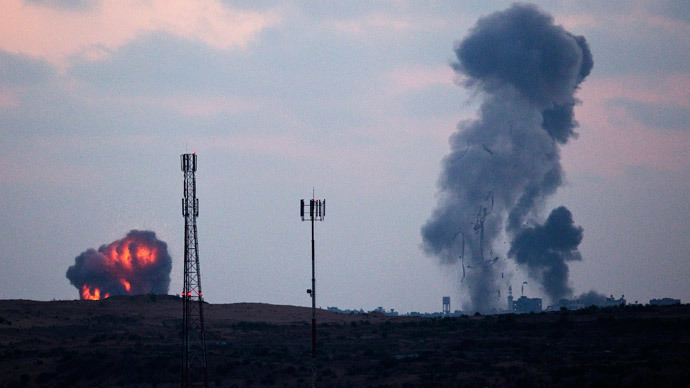 The IDF claims it has hit at least 200 targets in Gaza since Tuesday. By Wednesday evening, Israel's offensive had killed at least 53 people and injured over 450, while also striking scores of targets, Ma’an news agency reported citing medical officials. According to IDF, the airstrikes were necessary in order to stifle rocket fire from Gaza. 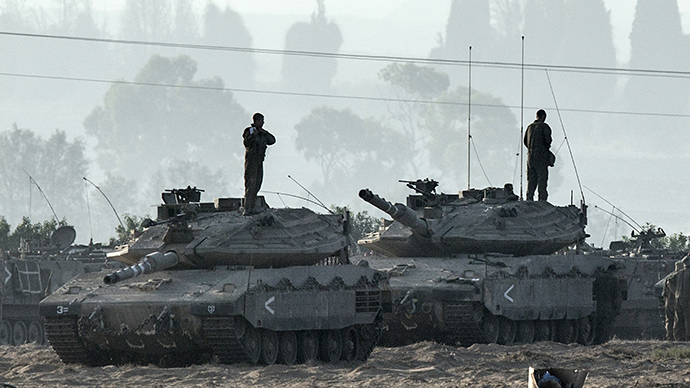 Israel indicated that a 'weeks-long' ground invasion could be rapidly approaching, reported AP on Wednesday. "Despite the fact it will be hard, complicated and costly, we will have to take over Gaza temporarily, for a few weeks, to cut off the strengthening of this terror army," Israeli intelligence minister,Yuval Steinitz, told Israel Radio. "If you ask my humble opinion, a significant operation like this is approaching.'" Israel has mobilized thousands of forces along the border ahead of the possible ground operation. Hamas’ Qassam Brigades launched three M-75 rockets towards southern Israel's Dimona nuclear site on Wednesday, causing no casualties or damages - one was intercepted and two fell in open space, an army spokesman told Reuters. According to General Moti Almoz's earlier comments on military radio, at which point 160 targets had been hit, the initial targets included 120 concealed rocket launchers, 10 Hamas command and control centers, two homes and many tunnels. Wednesday morning Palestinian militants fired more rockets at Israeli cities. 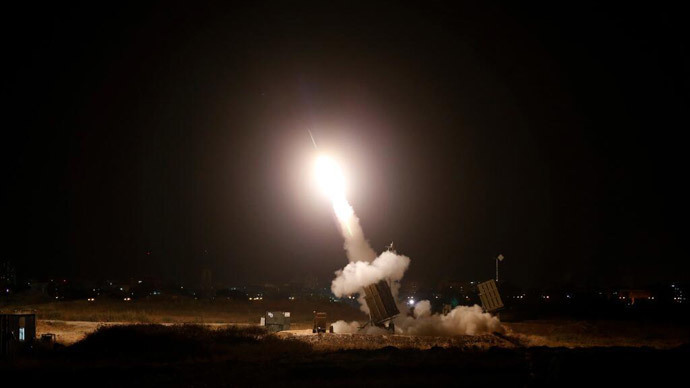 with eight rockets intercepted by Iron Dome defense system over Tel Aviv, Ashkelon and Ashdod. Yet, people ran to bomb shelters. Though Israeli authorities claim they target only Hamas militants, many civilians have been killed in a “ground offensive,” dubbed Operation Protective Edge. A few minutes ago, Palestinian terrorists in Gaza fired 3 rockets at Dimona. 2 fell in open areas; Iron Dome intercepted the other. The IAF official said that residents of the buildings targeted by Israeli Air Force for strikes tried to avert the attacks by going up the roofs en masse. Such ploys will not be effective, he added. At least 50 houses were destroyed on Tuesday and 1,700 were partially damaged, said Palestinian Minister of Public Works and Housing Mufeel al-Hasayneh. Defense for Children International Palestine (DCI-Palestine) also released its data, saying Israeli military killed eight children and injured dozens more. 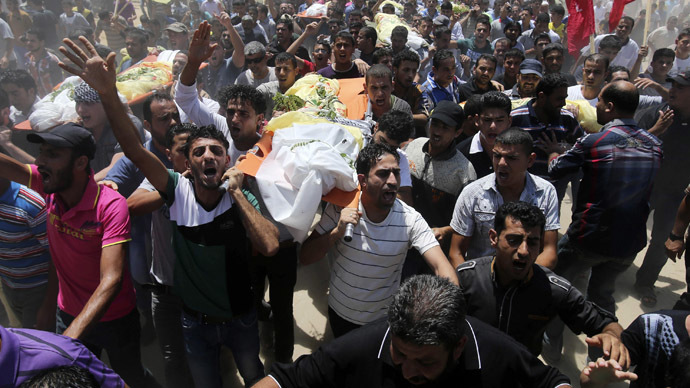 “Israeli forces killed six children when a missile struck the home of alleged Hamas activist Odeh Ahmad Mohammad Kaware in the southern Gaza city of Khan Younis,” said a statement from the organization. Overall, at least 28 children have been injured in the offensive in the city of Khan Younis. Also two Palestinian children died in strikes across Gaza: one from Gaza City’s Sheikh Radwan neighborhood, and the other from Gaza City’s Al-Shujaiyah community. The youngest child killed in the assault was 6. According to RT Paula Slier, who is in the area, several teenagers were killed when the Israelis targeted a house belonging to a Hamas militant. In a separate accident, civilians were killed when the IDF stuck a car in which militants were traveling. Among the victims is an 80-year-old woman killed in the Moghraqa area of central Gaza. A father and son were killed in the bombing of a house in the Nuseirat refugee camp in central Gaza by IAF aircraft, according to Palestinian media outlets. In the meantime, Israeli officials note only two troops injured. 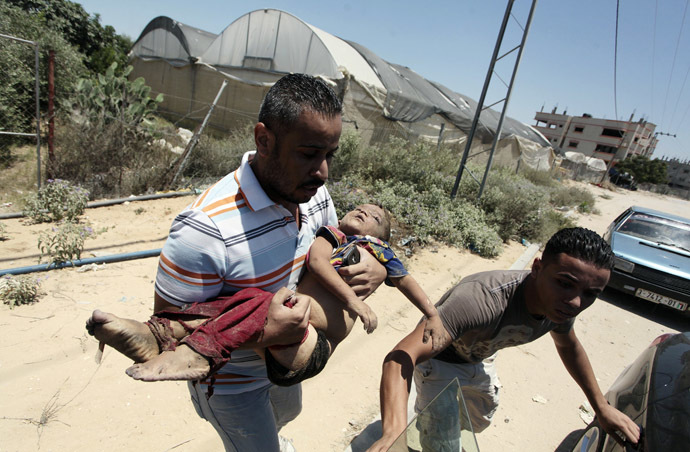 #Palestinian news agency reports death of a father and son following the last Israeli airstrike in #Gaza. The Israeli forces said that the IDF will continue military offensive in the Gaza Strip. "We'll continue with strikes that will exact a very heavy price from Hamas. We are destroying arms, terror infrastructures, command systems, Hamas institutions, regime buildings, terrorists' houses, and killing terrorists of various ranks of command," Israeli defense minister, Defense Minister Moshe Ya’alon, told Army Radio. He added that Israeli troops "will continue to hit Hamas and other terror groups in Gaza Strip from the air, sea and ground to ensure the safety of Israel's citizens." According to General Almoz the military "was preparing the next stage. This offensive will be a long one." “Reservists are being called in to replace conscripted soldiers [holding the line]. The moment they are ready, the soldiers will go south to prepare," he said. 50 homes have been partially or wholly destroyed since Israel's launched the operation, says #Gaza's Hamas govt. : local media.